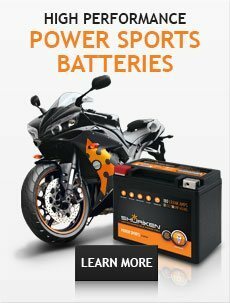 In addition to our popular Power Cell and Marine batteries, Shuriken now offers five new batteries for Power Sports applications and seven new models for Vehicles as OE replacements. These new batteries are designed to fit all of the most popular applications based on today's BCI and JIS fitment standards. Perfect for replacing factory batteries in motorcycle, ATV, UTV, Cars, trucks and RV applications including Harley Davidson, Honda, Yamaha, Suzuki, GM, Chrysler, Ford, VW, BMW, Mercedes and many more. The Power Cells continue to be extremely resistant to excessive heat and strong vibration. With super-low ESR and closely packed pure lead plates, each power cell packs a punch. Shuriken Power Cells are designed to deliver the winning edge at SPL competitions while providing the consistent backup power needed for powerful car stereo systems, especially when parked for parties and shows. Now, Shuriken batteries can be found powering anything from race cars and cabin cruisers to motorcycles and popular autos and trucks. Shuriken provides the constant voltage needed for optimum sound quality and other uses. These batteries all use absorbed glass matte (AGM) technology and are fully charged, ready to use direct from the factory. They are non-spillable and maintenance free. Because of the AGM design, they can be discharged and recharged hundreds of times with a one-year replacement warranty. 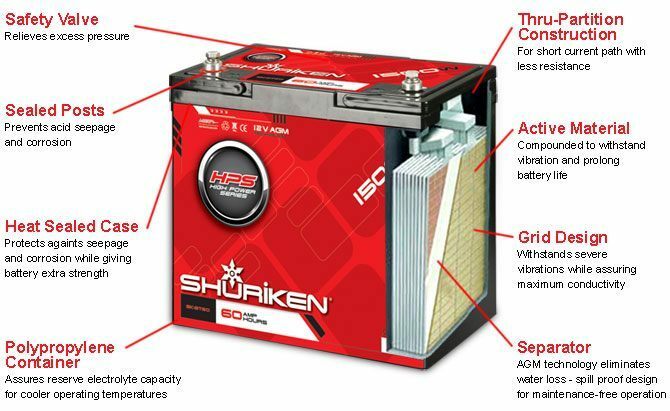 Shuriken continues to be a complete battery supplier and your one stop shop for your battery needs. Shuriken Power Cells are engineered for today's high-performance mobile audio systems. Utilizing Shuriken's Absorbed Glass Mat (AGM) technology, these rechargeable power cells can be mounted in any position and will not spill. Shuriken batteries can be found powering anything from race cars and cabin cruisers to trolling motors and winches. Shuriken not only provides the constant voltage needed for optimum sound quality and other uses, it limits the draw from the starting battery. Look to Shuriken for the latest in power cell innovation. Shuriken is a brand of Metra Electronics, the global leader in auto sound and other electronic accessories.